I'm just the messenger. Please, don't kill me. . .
Don't hate me because I'm psychic. . .everybody else already does. My name's Clair Ivers and these days my "gift" seems more like a booby prize. It all started when this crazy woman tried to bribe me into skewing a reading to warm her future sister-in-law's cold feet. Then the prospective sister-in-law threatened to kill herself at the altar if I didn't give her a phony reading saying she should break off the engagement. Oh, and did I mention she ran out, leaving her three-carat rock of a ring right there on my table? So what's an honest woman to do? Find the man who belongs to the ring, of course. And boy, have I found him. The minute I lay eyes on Jack Heron, I know he's the one. . .for me, that is. The problem is making him realize it once he finds out that I may be responsible for the flight of his fiancée. At least his grandmother likes me. Of course she thinks I'm someone else. And then there's the best man who keeps calling me for dates. . .and stock tips. Between the people who think I'm someone else, the people who wish I were, and the people who just want a bead on the winning Powerball numbers, I'm seriously considering packing in my deck for good. But not until I throw caution to the wind and make a play for my very own Jack of Hearts. 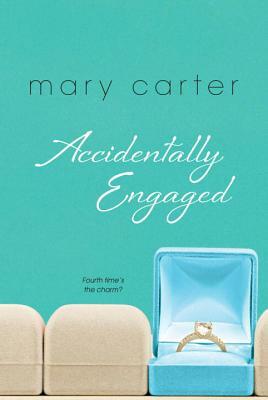 . .
Mary Carter is a freelance writer and novelist. In addition to her novels she has written six novellas: Return to Hampton Beach in Summer Days, A Christmas Carousel in There’s No Place Like Home, A Kiss Before Midnight in You’re Still the One, A Very Maui Christmas in the New York Times bestseller Holiday Magic, and The Honeymoon House in New York Times bestseller Almost Home. Readers can keep up with Mary on Facebook—Mary Carter Books, Twitter: @marycarterbooks or her website: marycarterbooks.com.